On December 12, 2010, approx. 30 members of Epsilon Sigma Zeta of Lambda Chi Alpha gathered to pay their respects along with family and friends at a memorial service for our fraternity brother Mike Mullins (EpSig 717), who lost his battle with brain cancer on Thanksgiving Day. Mike's brother-in-law, Pastor Bucky Dennis of the Pathways Church, presided over a moving service that included a slideshow of photos of Mike throughout his life, and remembrances from Mike's immediate family members about a man whose life was filled with strength, grace, humility, and love. When Pastor Dennis asked if anyone else in attendance might want to say a few words, Brother Dave Adelman strode to the front of the room and admitted to being one of the culprits who MAY have caused Mike's GPA to suffer a bit during his college years. Dave then invited all the other Lambda Chi's in attendance to join him in front of the room to pay tribute to Mike's memory. We tried to sing "We're All Good Brothers", botched it up pretty good, then brothers Len Poirier, Lee Troxler, and Jim Richards rescued us by speaking poignantly about Mike and his impact on us all. After the service concluded, many of the brothers in attendance gathered at the nearby Lazy Dog Cafe to continue reminiscing about Mike and about all the good times we had back in the day. Many old stories were told, many old friendships were rekindled, and I am sure that Mike was looking down on us and enjoying every minute of it as well ...... Rest In Peace, Mike. 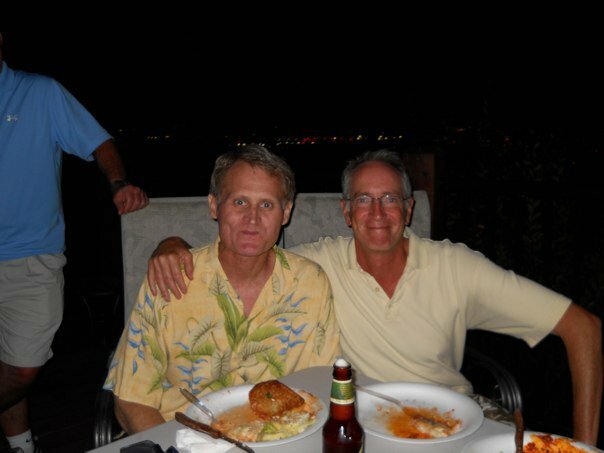 Photo was taken on October 2, 2010, at a gathering for Mike at John Horwitz's home in Santa Ana. Mike's on the left, Dave Shapiro (EpSig 760) on the right.